In a world of processed, devitalized, and contaminated foods, countless people are suffering from pH imbalances, toxins, useless or dangerous food additives, and disorders of the liver and blood. 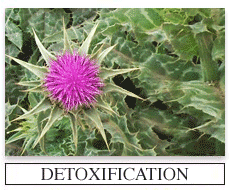 Alkalizing and detoxifying herbs can alleviate not just physiological symptoms but irritability, impulsiveness, and anger. Aloe Vera Juice, Inner Fillet, 16 oz. Contains: certified organic aloe vera juice from the inner fillet, citric acid (pH stabilizer), and potassium sorbate. Aloe Vera Juice, Whole Leaf, 16 oz. Lily of the Desert Whole Leaf Aloe Vera Juice enhanced with Aloesorb™ has been clinically demonstrated to improve the efficacy and vast health benefits of aloe vera including: increased absorption/bioavailability of vitamins and nutrients, increased immune support, enhanced antioxidant support, and reduction of nitrate levels. Other benefits consumers enjoy in Lily of the Desert aloe vera products include: support of a healthy digestive system, help in sustaining and promoting healthy regularity, and help supporting normal muscle and joint functions. Contains: certified organic whole leaf aloe vera juice and citric acid (pH stabilizer) and potassium sorbate. 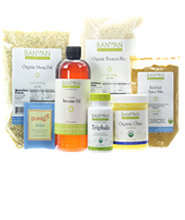 Contains: Organic Yellow Mung Dal (1.63 lbs), Organic Basmati Rice (3.15 lbs), Kitchari Spice Mix (3.5 oz), Organic Ghee (7.5 oz), Triphala Tablets (1 bottle), Organic Sesame Oil (16 fl oz bottle), and Pukka Detox Tea. Contains: standardized extracts of Kutki (Picrororrhiza kurroa), Bhumy Amalaki (Phyllanthus amarus), Kalamegha (Andrographis paniculata). Contains: extract of fresh Urtica dioica leaf 1:2.5 in organic cane alcohol, distilled water, and vegetable glycerin. Contains: Phyllanthus amarus leaf extract, 1:3, in Distilled Water, Organic Alcohol, and Vegetable Glycerin. Contains: Blend of Amalaki Fruit (Emblica officinalis) Extract, Haritaki Fruit (Terminalia chebula) Extract, and Bibhtaki (Terminalia bellirica) Extract in honey, distilled water, certified organic alcohol, and vegetable glycerin.